The use of chimeric antigen receptors (CAR) to enhance the ability of the immune system's T cells to target and kill cancer cells has advanced the treatment of patients with B-cell malignancies. However, CAR T-cell therapy for solid tumors has lagged, due to the complex microenvironment of solid tumors that includes suppressive cells, T-cell-intrinsic negative regulatory mechanisms and overexpression of inhibitory molecules. Recently, Cleveland Clinic researchers studied whether inhibiting the gene indoleamine-pyrrole 2,3-dioxygenase (IDO1), which is overexpressed in many cancers, along with using CAR T-cell therapy might prove to be an effective combination treatment for patients with solid tumors—specifically colon cancer. Their work was published in the Journal of Hematology and Oncology. 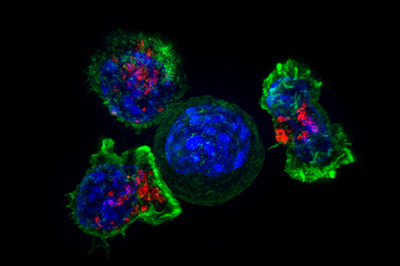 "We targeted the tumor microenvironment by downregulating IDO1 which allowed the CAR T to penetrate tumors and enhance the cancer therapy, said Yong Li, PhD, Department of Cancer Biology, and senior author on the paper. Later they transfected miR-153 mimics or a negative control into colon cancer cell lines and treated the cells with the cytokine interferon gamma, IFN-γ. Compared with mock treatment or a negative control, the miR-153 mimics substantially decreased IFN-γ induced IDO1 expression in all tested cell lines as determined by flow cytometry and by 60-90 percent by western blotting. Finally, they corroborated the results using several other methods. "These data suggest that IDO1 is a bona fide target gene of miR-153," said Dr. Li. Dr. Li said even though the miR-153 downregulated IDO1 expression about 50 percent in HCT-116 and DLD-1 colon cancer cells, it did not affect cell proliferation, cell migration and colony formation of these cells. This moderate downregulation of IDO1 had little effect on the cancer cells, he said. The researchers constructed a CAR against colon cancer cells using EGFR as a target. They used a "placeholder" CAR that is designed to target an EGFR variant found specifically in cancer (EGFRvIII), yet has restrained activity for EGFR, and tested it in immunodeficient mice. He said the next step will be to develop microRNA mimics that can be used directly in a patient at the same time as CAR T-cell therapy to see if the combination works better than CAR T alone in human subjects. Story originally posted on Consult QD.